Moorhen01263 715779work01603 870304fax Self-cateringMoorhen is a single storey barn conversion situated in South Elmham, just a few miles from Halesworth and Bungay. Surrounded by fields and countryside this barn along with the other three barns on site are in a very quiet location. It has exceptional accommodation for a group of four people and the benefit of shared use of an additional barn with games to enjoy. Nearest beach: Less than 15 miles. Nearest amenities: Less than 5.5 miles. Smoking: Not permitted at this property. Rooms: 2 bedrooms, 1 en-suite, open plan room with sitting/kitchen/dining area, 1 bathroom. Beds: 1 super king which can be made into twin beds (please specify your preference at the time of booking). Luxuries: DVD player, CD Player. WiFi. Utilities: Electric oven and gas hob, fridge with ice box, microwave, dishwasher, washer dryer. Other: Towels and linen provided, travel cot and highchair available to use. WiFi. 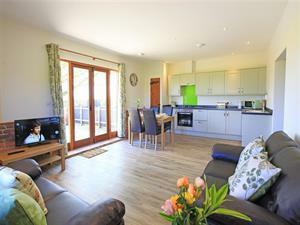 Outdoors: Shared communal barn with TV, games console, books and games, soft furnishings. Moorhen is a single storey barn conversion situated in South Elmham, just a few miles from Halesworth and Bungay. Surrounded by fields and countryside this barn along with the other three barns on site are in a very quiet location. It has exceptional accommodation for a group of four people and the benefit of shared use of an additional barn with games to enjoy.